Our venue offers a premium special events venue in a central London location and a stunning historical setting for filming, fashion shows and concerts. We are very close to Westminster Abbey, the Houses of Parliament, Big Ben and Buckingham Palace and our Grade II listed building is full of character and charm. We would recommend talking to one of our experienced Event Coordinators and AV Technicians in order to discuss your requirements. They will be happy to advise you on the best packages and menus for your event, or to help you create something completely bespoke. It was a pleasure working with you and your team and I was grateful for all the support you gave us during the day to make it a success. There was never any fuss and the staff were professional and helpful. 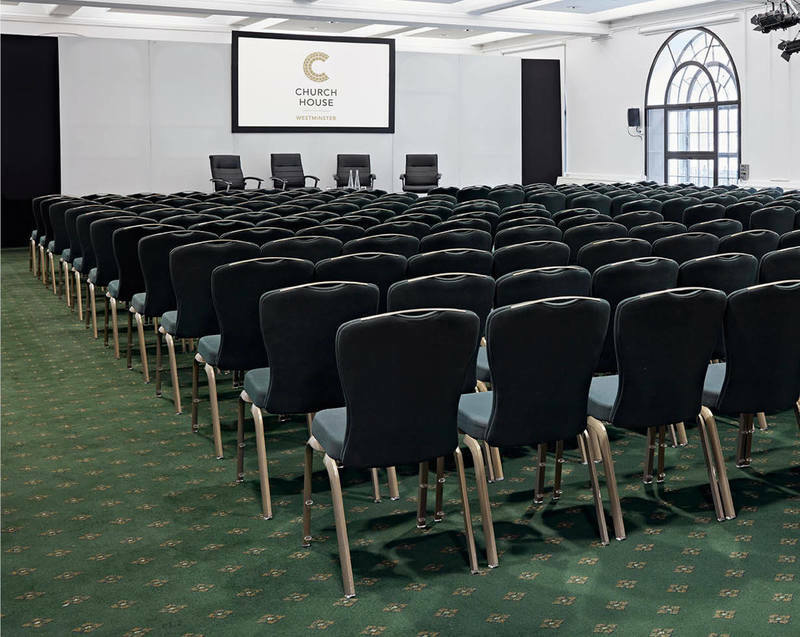 Church House Westminster is a stunning venue in the heart of London which provides lots of flexible and modern facilities to accommodate premium special events. Whether it`s a product launch, gala dinners, music and dance performances or TV shows, our unique venue can accommodate them all. Our largest event space, Assembly Hall, designed by world-renowned architect Sir Herbert Baker, is a perfect venue hall for a special event. It can accommodate up to 468 people on the lower level and 132 people in the gallery. A striking 30-foot glass dome and 15 arched windows will “wow” your attendees and make this your event an unforgettable night. Our in-house Audio Visual team of experts will work closely with you to create the perfect staging, lighting and sound for your event. We have developed solutions to suit your needs and transform any space to fit your event`s theme and requirements. Our in-house caterer, Ampersand, will provide you with a series of delicious, sustainable and ethically sourced menus. They will deliver mouth watering fork buffets and three course dining for that occasion. If you have any special requirements, we are happy to listen and create a bespoke menu that works for you, your guests and your budget. Over the years Church House has hosted a big number of a variety of different events. Assembly Hall accommodated events like fashion shows for London Fashion Week, wine tastings, concerts and debates. If you have any questions about our special event venue in Westminster, Central London please call us on 020 7390 1590 or fill in our contact form.